If you like what you see here, you want to be on this list! You’ll get all the latest updates to Excel Tactics, so you’ll never miss a new tutorial, tip, or tactic. But you also be the first to hear about new features, extra content, and any changes to the site before they go live on the site! Be part of the advance team for everything Excel Tactical! Get a Excel Free Keyboard Hot-Key Quick Reference! If you’re here, you’re interesting in learning how to unlock the power of Excel, and part of that is knowing how to save time. Knowing your way around the keyboard in Excel is often the quickest way to speed up your work and get things done faster! 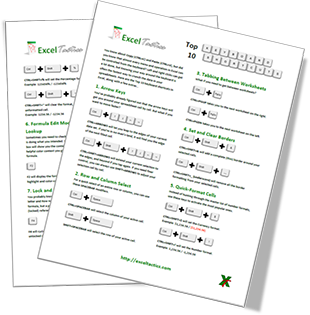 Subscribe to the Excel Tactics Newsletter now, and I’ll send you a 2-page PDF that will show you the Top 10 Excel Keyboard Shortcuts! See you on the newsletter!